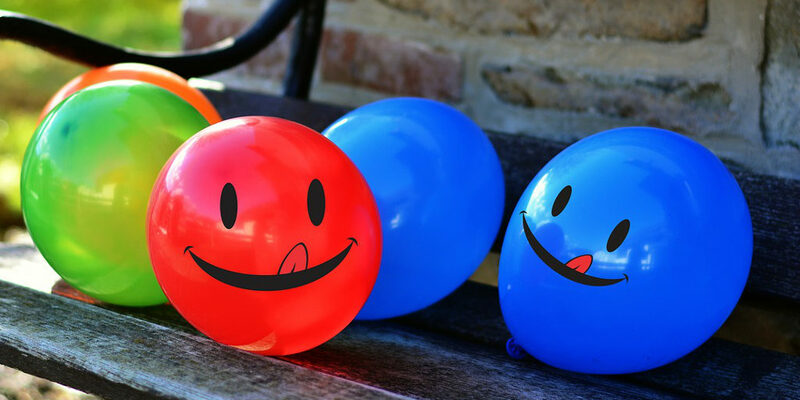 Today we have another new edition of our Beginner to Blogger series, a collection of interviews where personal finance bloggers share their biggest money lessons learned, favorite items to splurge on, and inspirations for starting a blog. After working for years in finance, I saw the importance of being good with money and how far behind I was. This is common with millennials because few of us receive any formal education when it comes to finance, so I wanted to start sharing what I was learning. That led to blogging and now I share money tips and tricks from a millennial and Canadian perspective. I never grew up thinking about money. My parents were comfortably middle-classed, but money was not a topic that was discussed at the dinner table. My real turning point was after university when I took an admin job in finance. All of a sudden I was surrounded by people talking about money and saw people reaping the benefits of investing and saving. I jumped in with both feet and started soaking up all the information I could so I could set myself on the right track. I was lucky to never get into a lot of trouble with money. My parents weren’t big money talkers, but they did support me through school and ensured I didn’t have to take on a lot of debt. That’s not to say I did nothing wrong. I did overspend on completely useless junk when I got my first credit card, but my biggest regret is not starting to save money earlier. I always worked through high school and university and even setting aside a tiny portion of those pay cheques would have me in a way better position today. Balancing what I want now with what I know I’ll want later. I’m not the person who strives to get out of the workforce at the first possible second, but I also know I don’t want to work forever. Trying to strike that balance between spending money in the present and saving it for the future is a skill I’m constantly working at. I know for a lot of people it’s being able to quit work and spend your days living as you want. That’s not for me. I enjoy working. To me being financially independent is all about flexibility. Right now I’m not concerned about job security or the ability to work, but anything can happen. 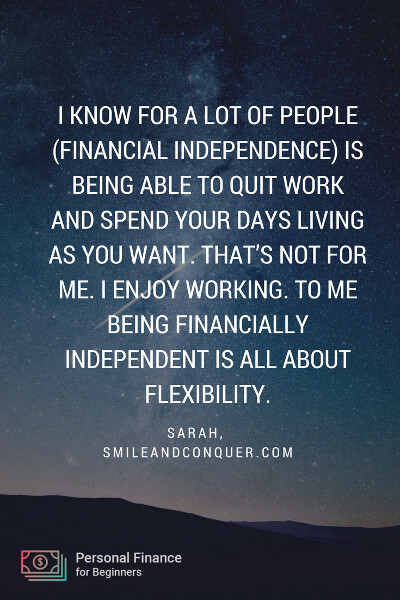 Reaching financial independence means I would get by without work if I had to or chose to. Maybe even more important to me would be the assurance that I have money to spend to maintain my current lifestyle. I dove into personal finance head first as soon as I realized it was something I need to educate myself on. I created my budget down to the penny, put all the money I could towards my debt and started building up an emergency fund. That was a huge lifestyle change and while I made progress, it burned me out. Now that I’m a few years in, I’m in a way better place. My budget is almost entirely automated and my spending level is consistent. I no longer track every penny and rarely look at my account values. Having a comfort level knowing the money will be where I need it to be was a big win. Specifically about my relationship, we communicate about money a lot more freely. I’m not married but have been with my boyfriend for 12 years. We still keep most of our finances separate but own a house together and obviously have many shared expenses. Keeping each other in the loop in regards to what we’re spending and how much we’re saving keeps us accountable. If you are offered any sort of pension or retirement matching plan, you need to enroll ASAP. Not doing so is like throwing away free money! And start saving as much as you can of each pay cheque. Even if you’re starting with $20, it will build good habits. Then remember when you get a raise to increase your savings rate so lifestyle inflation doesn’t creep up on you. That you need to know everything to get started. I’ve heard people use their lack of knowledge as an excuse for not saving or investing too many times. There are lots of fantastic resources out there to learn about money but often the best way to learn is by doing. Start by opening a savings account with your existing bank and moving money into it, then you can get more complicated as you grow your knowledge. I would have to go with automation. I’m lazy, so the more I can get off my plate the better. My recurring bills are all set on auto-pay and so are my contributions to my various retirement and savings accounts. My splurge purchase wouldn’t be a specific item but a specific event. My boyfriend and I are big hockey fans so we always go to at least a few games every season. Living in a big hockey city means tickets aren’t exactly cheap but it’s something I’m willing to spend on. We’re also on the waiting list for season tickets so that will be a mega splurge when our name comes up. I’m going to break the rule and give two because my first pick is Canadian and maybe not as relevant for American readers. My first recommendation is The Wealthy Barber by David Chilton. I didn’t give my parents much credit in a previous question but they did give me this book when I graduated high school. Being an irresponsible eighteen year old I didn’t read it for a few years but when I did it was a game changer. It’s both entertaining and full of important information. My second pick is Broke Millennial by Erin Lowry. This is a new one but I love Erin’s writing and it’s perfect for anyone looking to get started. I touched on this above, but it came from getting inundated with financial knowledge at work and realizing how much there was I didn’t know. At work, we primarily deal with people who are nearing retirement so I saw firsthand the impact of being well prepared and not so well prepared. Once you reach that stage it is hard to make corrections but by having that knowledge earlier you can set yourself on the right track. I wanted to find a way to share what I was learning with people my age and figured why not blog about it. I always enjoyed writing and it gave me a creative outlet to talk about my new found love of money. This one is actually easy for me; I definitely have a favorite post. Last year I did a round-up where I asked a bunch of other bloggers to choose their favorite post from the last year so I know that’s not the case for everyone! The one post I would keep is ‘You Don’t Have to Love Math to Love Finance’. It’s my favorite because there is this assumption that personal finance bloggers and other money nerds must be good at math. Not true! I’ve never been a math whiz and it was always my most disliked subject in school and yet here I am. There are ways to be good with money that doesn’t really focus on the numbers. Thanks for stopping by, Sarah! I really enjoyed the unique perspective you shared: not focusing on early retirement as the end goal and understanding that you can improve your finances without loving data and spreadsheets. How has your love – or fear – of math and numbers impacted you as you’ve learned more about personal finances?